The coffin of Santa Fe High School shooting victim Sabika Sheikh, 17, is carried during her funeral service in Stafford, Texas, May 20, 2018. Houston's Muslim community gathered to offer prayers Sunday at the funeral service for a 17-year-old Pakistani exchange student killed in a mass shooting at her southeast Texas high school. About 1,000 people, many with Pakistani roots and wearing traditional Muslim dress, converged on an Islamic center in Stafford to honor Sabika Sheikh, whose body was brought by hearse to the somber service from Santa Fe, the nearby small rural town where a student killed 10 people including eight students. Among the mourners was the late teen's first cousin who lives in the United States. She said Sheikh's relatives are completely devastated. "The family back home, we are in touch with them. They're crying every moment. Her mother is in denial right now," Shaheera al-Basid, a graduate student in the U.S. capital Washington, told AFP at the funeral service. "It's a shock we need our entire life to recover from," the 26-year-old added. Men lined up in rows offered traditional mourning prayers as Sheikh's coffin, draped in the green and white flag of Pakistan, was brought into a small, cramped sanctuary. Sheikh had been due to return home in mere weeks, in time for Eid al-Fitr, the holiday marking the end of the holy Muslim month of Ramadan. 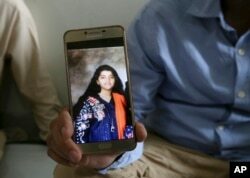 Abdul Aziz Sheikh, father of Sabika Sheikh, a victim of the shooting at a Texas high school, shows a picture of his daughter, in Karachi, Pakistan, May 19, 2018. "It's a shock, it's so sad," said realtor Ike Samad, 67, who was born in Pakistan but has lived here most of his adult life and raised his children as Americans. "I came here just like her, as a student," he recalled. "God forbid that could have happened to me when I was here. As a parent, it is just devastating." Samad also addressed the painful irony that a young woman from a country that many Americans associated with the war on terror in the aftermath of the September 11, 2001, attacks on New York and Washington was killed in a country that millions around the world see as a bastion of freedom. The attacks were a "tragedy, and tragedy sometimes teaches you life," he said. "But it also revisits, and in this case very close to here." Several Pakistani-American youths also attended the funeral service, including Danyal Zakaria of nearby Sugar Land, Texas. The 17-year-old said it was "truly mind-blowing" that an exchange student his age could be cut down in cold blood at a US school. "This nation is known to be safe," he said. "If America is not safe, then where is?"